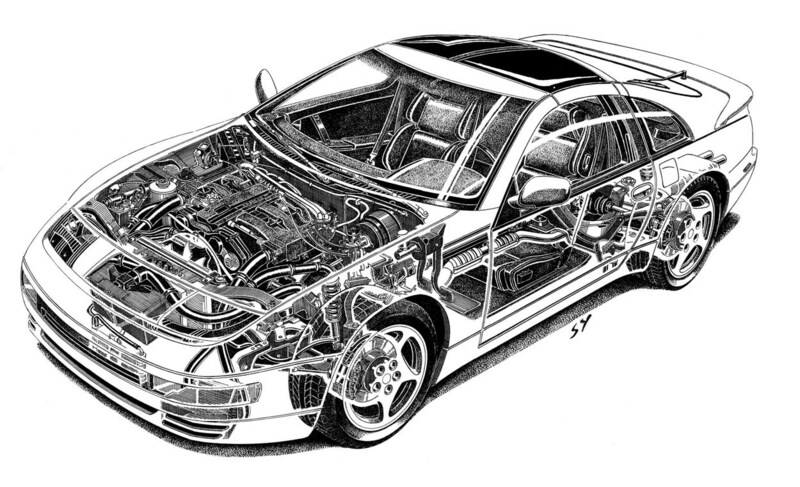 I am very glad for your offer to make a lithograph of the 300ZX Twin Turbo. As my schedule, I was going to draw Renault Alpine A110 after Porsche Carrera GT. 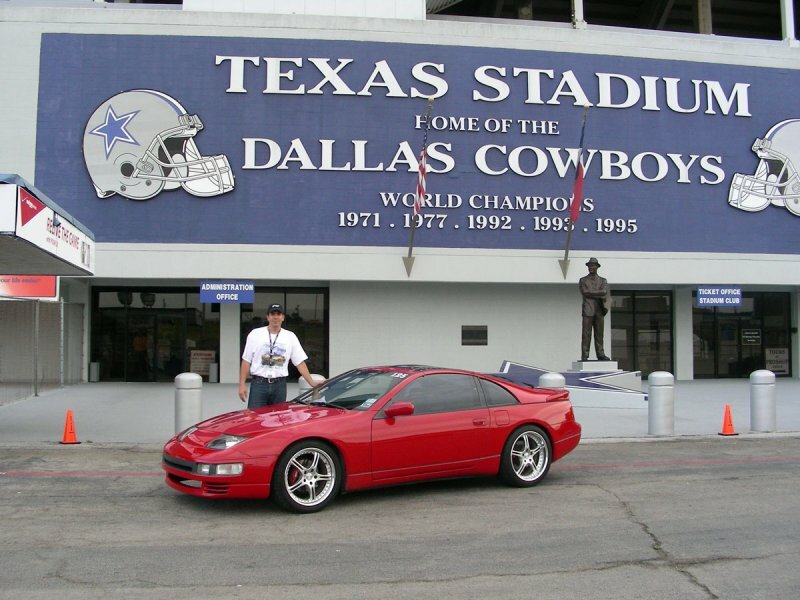 But I have changed my mind from Renault to Nissan immediately when Mr. Scott Hibbeler contact me about the 300ZX drawing. I really like your zest for the 300ZX. I offer you 300 Limited Edition for $45.00/each, the same as Steve Millen's 300ZX. You take enjoyment in the process of my work. I keep your number by 02/08/2009. Please make an order in a hurry if you would like to have the same numbering as the IMSA Race Car. Z special shop Datsun Freeway send Hasegawa's 1/12 scale model, Kyosho 1/43 scale model and sales brochure of 300ZX TT for my drawing! Thank you Hiro san. I start pencil drawing with this angle! Almost finish,I will finish on 15th and start print. Right side corner I put correct wheel! Also I will finish pre-order sale on Sunday. Thank you for 90 orders for this drawing. Sunday night I put final drawing on this page. Still I'm woring on this drawing for final touch! Last night to today so many people send warm and encourage message to me. I was angry for some punks posted irresponsible and negative message on TT net. But I know still many people enjoy and support my artwork. I'm OK now, I'm sure tomorrow morning I pass this drawing to print shop and start next drawing. Thank you for all of my artwork lovers! It done! and on the hand of printing shop. Thank you for 101 pre-orders. Also ended pre-order sale and limited edition is $55.00 now. This is final for print ! Print shop delivered posters to my office on time! I start signing on each poster. All of Limited Editions are packed and mail out this morning! 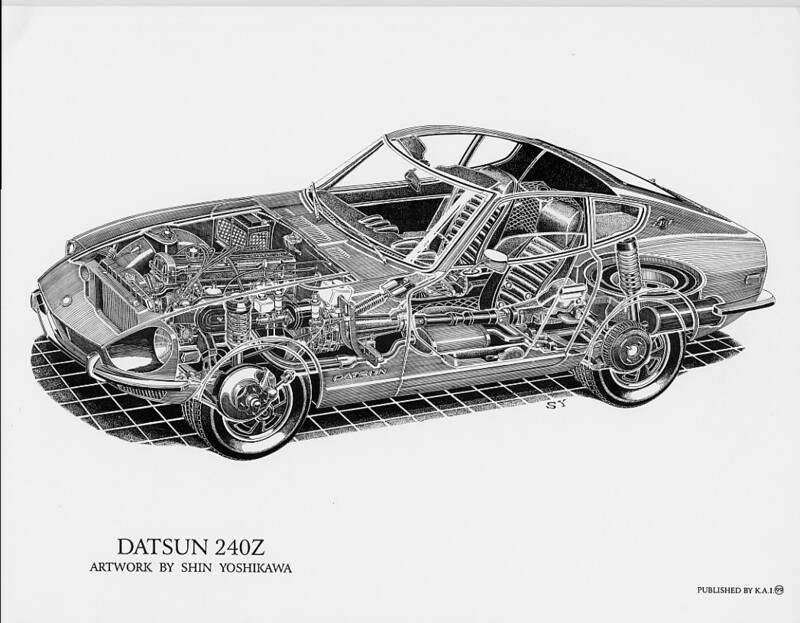 Long time out of stock Datsun 240Z poster is available now. Please order in Nissan/Datsun page.